Virtua Fighter 2 © 1996 Sega Enterprises, Limited. 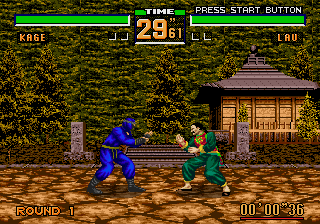 Virtua Fighter 2 for the Sega Mega Drive was released in 1996 in Europe. There was no cartridge release of this game on the Mega Drive itself in Japan. [EU] Sony PS2 (feb.2, 2007) "Sega Mega Drive Collection [Model SLES-54333]"
Sony PlayStation 2 [AU] (feb.8, 2007) "Sega Mega Drive Collection"
[EU] Sony PSP (feb.2, 2007) "Sega Mega Drive Collection [Model ULES-00556]"
[AU] Sony PSP (feb.8, 2007) "Sega Mega Drive Collection [Model ULES-00556]"
PC [Steam] [EU] (oct.26, 2010) both stand-alone and as part of "SEGA Mega Drive Classics Pack 3"
[EU] PC [MS Windows, CD-ROM] (nov.26, 2010) "Sega Mega Drive Classics Collection Vol. 3"